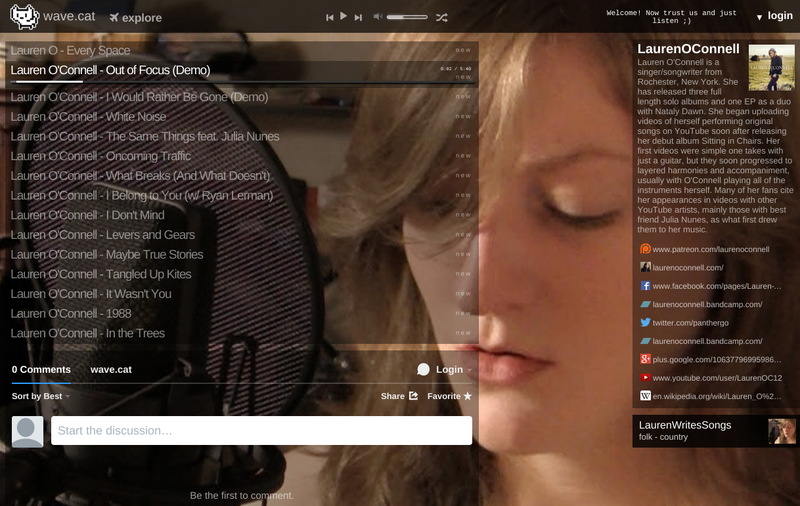 Wave.cat is a music streaming, play list building service that acts as a 'second-skin' for Soundcloud and Youtube. It allows users to build unlimited playlists using freely available tracks and offers 100% uninterrupted playback without any advertisements. Every playlist on wave.cat is hand-picked by a community of real people - not faceless computer algorithms. wave.cat users search for their favorite tracks from YouTube & Soundcloud and create new playlists to share with a growing community. An intuitive drag-and-drop interface allows users to easily build and structure playlists in a matter of seconds, arranging the music however they wish. Wave.cat is the brainchild of Pedro Esperança, a workaholic programmer and music lover who likes to listen while he works. Pedro noticed an annoying trend that was hampering his daily music fix - he always had to choose a new song at some point, which meant stopping his to work to find a new track. He looked for playlists to remedy the problem but these almost always came with advertisements, which sullied the listening experience. Pedro used Dropbox to create a 'website' of streaming music, asking his friends to contribute and set up “a great playlist” for him to enjoy while working. The playlist was a big success and soon spread outside of his circle of friends, eventually earning up to 2000 visits per-day. People were listening. To invite further collaboration, Pedro decided to make wave.cat – a free playlist building platform for everybody to use. Steve Biddick of Omerta Game Ltd got involved with Wave.cat in July 2014. So, for those that aren't familiar with WaveCat, please explain what WaveCat is. What inspired you to create WaveCat and how long ago did you start this project? Steve: We have three offices - a UK one, a Hong Kong one and a dev lab in Lisbon, Portugal. We listen to music all of the time and have a diverse range of genre interests. Discussion about 'what constitutes good music' lead to many agreements and disagreements, eventually that there was a need for a playlist sharing method with no whistles and bells. WaveCat is made from those discussions. Workaholic programmer Pedro Esperanca made the first cat, putting a few files he owned on dropbox and making a simple webpage to serve these. Anyone in the office could open and play the page. Pedro didn't want to keep choosing new songs, which meant stopping to work to find new tracks. Playlists on other sites are littered with annoying advertisements (in the Chinese office these are in Cantonese and none of us speaks that language) We didn't want ads in playlists in the office. We eventually got a bit tired of the Dropbox playlist, and asked some musical friends to collaborate in setting up a better one. They really liked the visual format and set up four libraries of recordings, which we also hosted on Dropbox. These lists can all be found at http://wavecat.wave.cat - so that the collaborators could listen too, we put it on the web. There was a big local response in Portugal - with the list going locally viral via Facebook. Soon we were getting 2000 visits per-day. People were listening. To invite further collaboration, we decided to make the current version of wave.cat – a search-engine based free playlist-building platform for anyone can use. Seeing the huge potential of this 'second skin' type website, after Pedro moved to a new project, working for a different company, Omerta Game ltd CEO bought the site in July '14. Neat fact: as the money transfer completing the purchase of wave.cat went through, Steve was just touching down in Catalonia, where the .cat TLD is based. What makes WaveCat different from other Playlisting websites and why is this one better? Steve: Wave.cat is a 'second-skin' for Soundcloud and Youtube (we plan to add more services as we grow, but those two have the biggest online repository on the web, so a good place to begin. Search Engines are 'second skins' too (Second skin websites were predicted by David Gelernter in his seminal book 'Mirror worlds', published in 1991). What it means is that the content is elsewhere, or 'lots of elsewhere's' and then collected together in a neat visual format by wave.cat for relay to consumers, but leaving out the bloat and spam, both visually (banner ads and leadins to other parts of those websites) and audiably (playable ads). Wave.cat replaces these with an awesome neat visual format, drag and drop UX and without all the trimmings. Another advantage is 'social music sharing' - wavecat playlists are sharable with other users. We have teams of DJs putting together playlists from club nights gone by, playlists made by all members of a band and friends just sharing tunes they love, or sometimes loved years ago. We are making it easier to share curated lists of music, between friends and friends of friends. 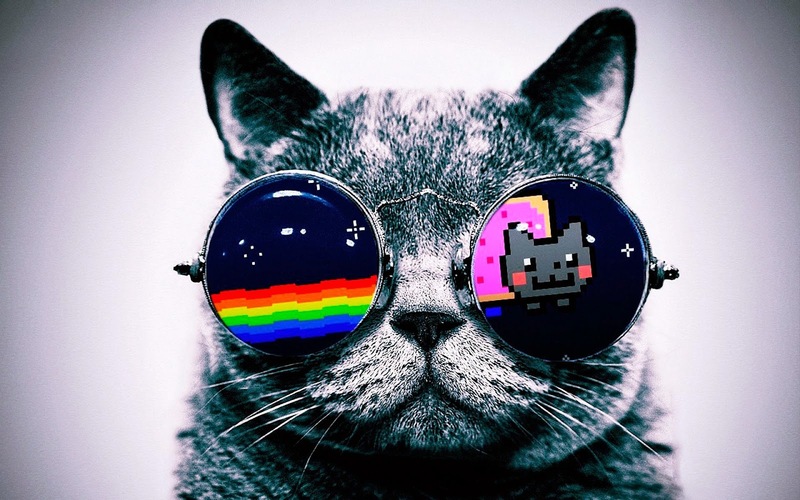 Plus we have an 8-bit cat and a cat wearing shades for our logo. What's not to like? In comparison to Spotify and Pandora, how is WaveCat’s sound quality? Steve: Sound quality at-source depends on the tunes you pick when you are making your wave.cat. You will find that when a tune on YouTube is a poor recording, there are typically multiple instances available - when I make a list I sometimes go through two or three before I find the one I like. As already mentioned wavecat isn't a steaming service. See it a s prettified search engine for music, cross-platform, with savable, sharable results. We think that's different. Roughly how many songs does WaveCat have and how many songs per day are added to your database? Everybody thinks the cat is cool, even (Wiki inventor) Ward Cunningham saw the potential. That was a big moment for the team. We are geeks. It was a 'we are not worthy' moment (like when Wayne and Garth in 'Wayne's World' meet Alice Cooper and throw themselves down at his feet). What are some of the best features of WaveCat and why WaveCat would make people drop their current music platform? We suggest you try that - register at wavecat, start a new playlist, open SoundCloud or YouTube, grab the playlist of your choice, drop it's pagelink into the Cat and choose a groovy background image. Really - try this - you will see that a fantastic looking new playlist is made and ready for sharing in seconds. We also have a great mix of user and professionally curated playlists, you can choose from these and play without ever being nagged to sign up. Now, these playlists are created by fans, correct? For the unusual tastes, does WaveCat cater to people that love Anime and video game music? Steve: Sure - there are some K-Pop and J-Pop lists in there and all sorts of oddities. You are limted only by imagination. Make that list for is if it is something that you love. We want to hear it! In fact, I'll personally send a free air guitar to the first person who sets that up. Currently, is Wavecat mobile friendly? Is there an app? If not, how soon do you think it will his come out of development and get into the hands of fans? An iOS version will follow. We are kind of in stealth mode for now while these apps are being made. If you are reading this on a phone and wonder why wave.cat does not work on your phone, launch it in a browser - it will soon! What are some things that music lovers can expect from WaveCat in 2015? Steve: The app. The app and the app. Then we will add some new services and expand all the sharing stuff. More WCOD (Wave cat of the day) lists from new bands and celeb bands alike. We're currently promoting musicians who we have ties to via social media, particularly encouraging those who have made a WC to promote their band or brand. Some more experienced bands have featured (OK, Go! Pomplamoose) and some up and coming ones like Lake Street Drive.